Nokogiri kuwagata (saw stag beetle, Prosopocoilus inclinatus) is one of the most common beetles among the common Japanese stag beetles. 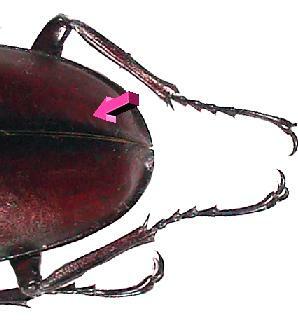 It is probably the 2nd most common, next to Ko kuwagata (small stag beetle, Dorcus rectus), which can be found anywhere. But I wouldn't say, "Only rare species are worth rearing," and do believe that most Japanese would say that Kabutomushi (Japanese rhinoceros beetle, Allomyrina dichotoma) and Nokogiri kuwagata are the beetles they once dreamed of in their childhood. (Though I must admit that in some areas Kabutomushi and Nokogiri kuwagata may be more rare than other species). When I was a kid, I never heard of Ookuwagata (large stag beetle, Dorcus curvidens) and I think it is more fun to make these bellicose Nokogiri fight each other than just to watch the gorgeous looking but very timid Ookuwagata. If people abroad could see both species for comparison, I think they would equally appreciate the beauty of both species. The only drawback of Nokogiri may be that it does not live as long as Ookuwagata. It has been several years already since I got hooked on beetles for the second time in my life (the first infection of this hobby, in childhood, is almost inevitable in Japan). I have come to notice that I really like Nokogiri, though Ookuwagata has been enjoying a kind of boom here for the past few years. Although it is a very common species, it is getting harder and harder to find them in numbers when you go into forests with your kids, because of stupid cutting down of acorn trees and the absurd continuation of excessive cypress plantations. In the hope of recreating the exciting nearby environment we older generations enjoyed every summer morning, where such gorgeous beetles were abundant, I joined the nature conservation volunteers at Mitaka Nogawa park. For the time being, I believe I need to study the rearing methods for these beetles, to restore such forests in the future. Those under rearing are exhibited at the nature observation center and attracting many kids who visit. That's why I have been eager to continue with Nokogiri breeding (yet some people say I am so lazy....). I like the curves of their nice mandibles! The body is reddish. 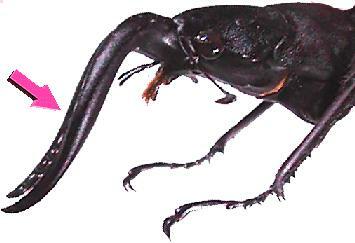 The remarkable feature of Nokogiri is that the shape of its mandibles changes drastically, depending on its size. According to a picture book I have, the variation of its size is from 26.5mm to 74.7mm (male) and 25.0mm to 37.6mm (female). And when you compare the shapes of mandibles and the teeth, small males and large ones may look as if they were totally different species. The same is true to some extent of Ookuwa and Miyama, but I feel the variation is even greater with Nokogiri. As a matter of fact, when I was a kid I used to believe the small ones were different species, and called them in Tokyo dialect "Okachimenko" (or maybe that was just a very local name in my vicinity). I learned later that in many areas those gorgeous large ones with beautifully curving mandibles are called "Suigyu" (Water buffalo). This is a saw. This is a water buffalo. This is a female. Compared to Miyama, Nokogiri seems to be narrowly escaping extinction, even in the suburban areas like Mitaka in Tokyo. I still find a few in nearby forests, though they are much more rare than they used to be. Its distribution is also very wide, ranging from Hokkaido to Kyushu. It is found in practically all areas of Japan, except the Okinawa islands, as those found there are counted as various subspecies. The altitude of their distribution is also very wide, from zero up to 1000 meters. Therefore its rearing is relatively easy. Compared to a delicate kind, like Miyama, Nokogiri is robust and doesn't die too easily even if it is pretty hot (yet an environment of continuous 35 degrees C for example would certainly weaken them). I haven't really experienced death by the individual becoming overturned by trying to climb the wall, as with Miyama, either. Just prepare some mat, humidity, food, whatever...they survive anything somehow. pulling them out of the pupation chamber to play with them, etc. which makes them weary during or before hibernation. total negligence leading to complete dryness during hibernation, because it's so boring (especially when using a plastic container with a wide opening). That's how I killed some. So this year, I just gave up on their pupation chambers, and pulled all imagoes out of the chamber after emergence and kept them in sections of a lure case filled with adequately moist mat and closed the lid. This way, you don't have to check the moisture in many bottles and cases one by one. Also, if you close the lid, it doesn't get very dry and you practically don't have to do anything during the winter. And then you can free up a lot of space you needed for many bulky bottles (maybe this was my most urgent reason). Air? I don't think you have to worry about it at all. It is not completely sealed this way, and in the first place, their consumption of oxygen is next to nothing, as they are hibernating. Other than that, keep them under moderate temperature, not too warm, not too cold. If it gets too warm they may start unnecessary activities just to become tired, and they may die if a temperature under the freezing point should continue too long. In my case, I kept them in a room without heating, which was around 10 degrees C during the winter, with some coldest days being possibly 5 degrees. Many in hibernation, in a compact way. Don't bother them just to tire them out. Still, some may die. Getting eggs is not especially difficult with this kind. Just rear them in mating pairs. In my case, for the past 3 years or so, I have succeeded in getting enough eggs without doing anything special, like separation after coitus, etc. Rear one pair in a plastic container of 20cm or 25cm in width filled with 10cm (in depth) of rather wet mat, and place very moist decayed wood pieces on top. If the mat is not pre-fermented it may start fermentation and may smell a little sour, but you don't have to worry too much in such cases. Nokogiri doesn't seem to be bothered too much. If the environment is not wet enough, it does not lay eggs very easily. This is maybe because its larvae prefer a very wet environment. Unlike Ookuwa, Nokogiri does not really bore long holes in decayed wood to lay eggs. It just makes crumbs of such woods, and lays eggs mostly in the crumbs or between the crumbs and the pieces of wood. If the wood is soft enough, it lays also in the wood and it may also lay eggs just in the mat even if there is no bed wood. So the best suggestion for getting eggs would be to place some very wet and soft decayed wood pieces on top of very wet mat. In a natural environment, it lays eggs in summer or in the beginning of autumn. If you check the mat or wood pieces in the autumn, you'll find some young larvae. I have gotten about 20 to 30 eggs per pair for the past 3 years or so without doing anything special, except for paying attention to the amount of moisture. Some people report that Ookuwa females prepare certain wood crumbs with useful bacteria for burying their eggs in special laying spots, and if you take out these eggs they may not hatch. But for as long as I have been testing with Nokogiri, there have been no such cases. As long as I kept them in the wet mat, they all hatched. Even those that tumbled out, and whose original place I couldn't find hatched without any problem. Important factors are temperature and humidity. Never put them in dry mat and keep them rather warm. Those that were born late in autumn may take an especially long time to hatch, as the temperature tends to stay low. Although I have not tested this by isolating individuals, it seemed to have taken 2 weeks to a month till they hatched. Some of them might have needed even longer. Although the humidity is important, you can't keep them completely soaked under water as it may suffocate the eggs. In that case, the eggs will soon become rotten. 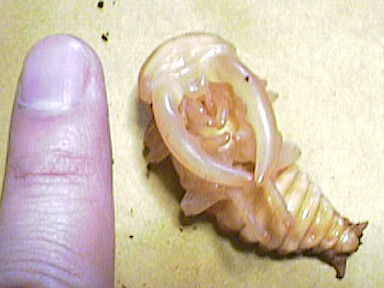 The key to rearing Nokogiri larvae is to maintain enough moisture. Very wet and even sticky. You can first dip the entire mat stuffed in the bottle into water, and then put the bottle upside down on a sheet of paper towel and let the water drain for about an hour to get the right substrate. As long as you keep enough moisture, some flourishing of blue molds or yellowish slime molds don't seem to matter for their larvae. They are very hardy. Because I use this kind of mat, the contents of Nokogiri bottles eventually turn into a rather dark, sticky looking substance. Also, their excreta are very loose and do not stay in hard round pellets, like those of Ookuwa or Kabuto (Allomyrina dichotoma). As you can see in the picture, one of the characterics of Nokogiri bottles is that some parts turn into funny yellowish substances. I wonder if their exctreta dissolve into the substrate to create such areas. Now, the best way to keep enough moisture inside the bottle is "not to drill any airholes in the lid." You might wonder if this sounds rather absurd. But I have never experienced any suffocation with this method. In the beginning, I kept all my Nokogiri larvae individually in the 100g Nescafe Gold Blend bottle (the weight is of the original coffee powder and the wet mat itself gets much heavier than that). By removing the styrofoam packing from the lid, you can secure enough ventilation. Small flies can be avoided this way and you don't have to go through the troublesome work of individually placing a sheet of paper or cloth between the lid and the bottle. Actually, I am so lazy that I could never take care of too many bottles with this method. Drilling an airhole in the lid is just a waste of labor. These larvae usually eat the roots of rotten trees, underground, and don't need too much ventilation in the first place. If it does die of suffocation, the reason is not the consumption of oxygen by larva itself but by bacteria that may appear when the mat is mixed with flour, etc. and starts radical fermentation. Therefore, you don't have to pay too much attention to ventilation as long as you use the prefermented mat, which has been prepared separately beforehand. In relation to this topic, I have often sent some small stag beetle larvae abroad, totally sealed in a small pillcase without any air holes. They were generally fine, even in the worst case when it took almost 2 weeks to reach their destination. I might have to think of a better way for warmer seasons but still, this is an extreme case and you shouldn't have any trouble with common glass bottles. I am more afraid of dryness caused by excessive ventilation. Because of a baby boom of Ookuwagata in the summer of 1997, I was a bit negligent with Nokogiri breeding. But I got 29 eggs and hatchlings from the pair I exhibited in the Nogawa Park Nature Observation Center, and finally 25 larvae were secured. As the eggs were born rather late, in September and October, I kept about 20 of them in the space I could spare in the greenhouse I happened to have prepared at that time, each one in a separate pillcase under 25 degrees C. As all the eggs hatched OK after a while, I moved each of them separately into 100g coffee bottles. The mat I used was what I prepared for Ookuwa, the prefermented mat with a low percentage of flour. I put in extra water, so that the mat was completely wet. I filled the bottle with the mat very tightly and released the larvae on top of it, together with the contents of the pillcase, and confirmed that they had all dug in within a day. After a while, as I repeatedly heard that a few percent solution of sugar and honey may be added for better results in Nokogiri breeding, I tried adding that to some of the bottles. But maybe because the mat contained flour from the beginning, I didn't get any impression that the addition had any extra effect. It may be different if I add that from the very beginning, though. Well, I got the greatest larva by the mat that contained flour. Maybe I don't have to bother thinking of anything else. Actually, I had been planning to take them out of the greenhouse. But before I knew it, it was already winter, and I thought that it wouldn't be a good idea to take them out of a 25 degree room to a room temperature of 5 degrees all of a sudden. So I continued to keep them there. Do you think I was just lazy? Maybe you are right. As a result, the larvae continued to grow steadily and achieved something totally beyond my expectations. In February, some of them, I observed from outside the bottle, looked extravagantly large. So I decided to take a few of them out to weigh. They were all around 15g, 16g. When you think that the largest I had ever found by cracking naturally decayed wood or reared from eggs were possibly 10g to 12g and they all turned into fair enough sized imagoes, a 16g larva is a monster for a Nokogiri larva. When the size is the same, Nokogiri larva is much lighter than Ookuwa larva, because the body shape is much skinnier (and maybe its specific gravity is lighter). This could be a 30g larva if it were an Ookuwa counterpart. I am very much looking forward to its emergence. As it was such a pity to keep a 16g larva in a 100g bottle, I moved 3 of the largest ones to 150g bottles with some additional food. As their pupation chambers are horizontal, I keep all those 100g bottles laid down. So far, I have been keeping the 150g upright, but I wonder if I had better lay them down later, too. Now, all I need is their healthy pupation and emergence. As you can imagine, they don't grow during the prepupa and pupa stages. So we try shortening these periods by warming them till emergence. And as a result I completely lost the chance to take them out of the greenhouse. Under natural rearing without warming, Nokogiri are born in summer (in my case mostly at the end of summer) and grow possibly to the 2nd instar by winter. Most of them require another complete year (2 complete years all together) till emergence. As a matter of fact, I have a few outside of the greenhouse this year, too, which were born the year before last. They are not really large at all, which means that a longer larva stage does not assure large imagoes. On the other hand, those in the greenhouse consumed only as little as the flour-added mat in the 100g bottle and 2 females have pupated already (in March, which means it took only a half year from egg to pupa). Males seem to take a little longer. And these female pupae are incredibly large. Although the largest female is supposed to be about 38mm according to various picture books, this pupa is 38mm with its head tucked in and the tail bent forward a little. Won't it reach 40mm if its head and tail straighten after emergence? But maybe its abdominal region will shrink after emergence and the size will be in the high 30s. Still, it is very large. Prepupa This one was right under the lid. Couldn't get any good pictures of a male pupa. So these are the pictures of a large female pupae I have now. 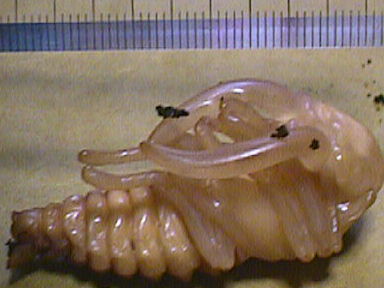 Many large pupae have trouble with mutational emergence, caused by a collapsed chamber or by insufficient room in the chamber. 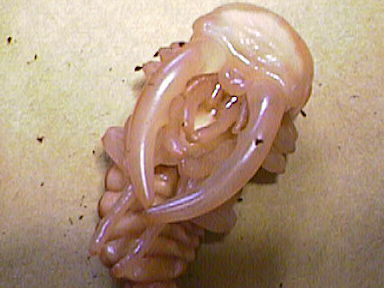 But these pupation chambers are abnormally large, after the contents of the bottle have been completely consumed. Or should I say, it is just a room created by the mere rolling of the prepupa to harden the walls of the almost empty bottle, rather than a "pupation chamber". So I was able to spoon it out without breaking the chamber to take pictures, and put it back there without any problem. It should take another month or so from prepupa to emergence but I wonder if it will be quicker in the greenhouse. I wish even that their normal hibernation period could be shortened to, say, 3 months, so the ordinary cycle of 3 years is improved to just a year, making breeding easy. This summer, this is what I will be wondering and hoping for. Because the large Nokogiri I reported on in the rearing manual in the April issue have emerged (both males and females are fine), I will report on them briefly, with some pictures. This is the male pupa. Just like the female pupa I reported on last time, I could spoon it out of the chamber in the bottle without breaking it. It was as large as 5cm and I expected with excitement that it could emerge into a record size of over 7cm. And this is the emerged imago. Well, I just confirmed that a Guiness size is not easy. It was only 64mm. But still it is very significant that I was able to rear such large ones for the first time. It is very difficult to get such large ones out in the field, too. 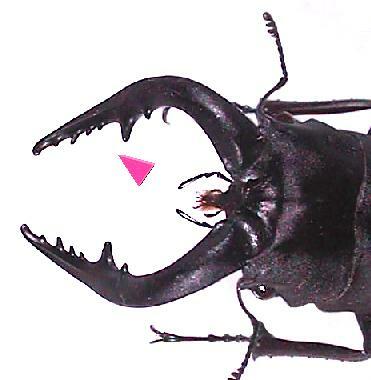 When I had a stag beetle maniacs party on June 6 at my house, A.CHIBA and K-sugano, on seeing this imago, instantly stated, "This one has a funny head protrusion. Its teeth are different and the color is somewhat different. Maybe a hybrid of some Prosopocoilus dissimilis". They're great subspecies maniacs. I am so lazy that I don't pay much attention to small differences. But when I observed it closely after their remarks, I had to admit that it did have such features, and didn't look like the pure Prosopocoilus inclinatus of mainland Japan. But I still think that the difference may come from the rearing environment, similar to the case with Lucanus maculifemoratus which Tanida reported on in his manual. I bought their parents at a DIY shop in the vicinity for 780 yen or so, for exhibition at the Nogawa nature observation center. They were sold as common P.inclinatus and P.dissimilis were sold separately for much higher prices in the same shop. Anyway, even if they are hybrids, they can't grow so large very easily, just because of that, and my rearing method can't be wrong. Now, these are the female imagoes. They are mostly 36mm. Although again, they are not Guiness size, they are among the largest. I had never seen such large female Nokogiri before myself. I am so glad that almost all the females are of this size. According to my subspecies maniac friends, these females have distinct stripes on their elytra, so my friends believe again that these imagoes are not pure P.inclinatus. The remarkable thing was that some of them became completely black after a few weeks, while some of them maintained the same reddish color. I was very pleased that there was no mutational emergence. But unfortunately there were only 5 males versus 10 females. Also, not all of the males were very large. 2 of them were just possibly large teeth type. About 10 more larvae were kept outside of the greenhouse. They seem to follow the natural 2 year and hibernation life pattern and they are yet small 3rd instar larvae. As I hate to take them out of their environment, I haven't really tried checking their gender.